Steps you can take to reduce human/coyote conflict. Coyotes are an important part of the natural ecosystem in the Albuquerque area, and do not distinguish between wild prey and unsupervised pets. The City of Albuquerque promotes conservation of native wildlife, and will only take steps to remove urban coyotes in extreme circumstances, where there is a clear indication that a threat to humans exist. Follow the guidance provided here to discourage coyotes from entering your yard or endangering pets. Coyotes are a common wildlife species throughout the City of Albuquerque. Most sightings do not require any action. Enjoy wildlife at a distance. If you encounter an aggressive coyote, or suspect it may be injured or sick, report it to the City. Coyotes visiting a property should be actively hazed. See below for hazing instructions. Take steps to discourage coyotes from visiting your property by removing attractants. Animals that are suspected of being aggressive, injured, or unable to leave a property should be reported to the City. We do not recommend trapping coyotes. Leg-hold traps are not legal in the City of Albuquerque. If you come across a coyote in some type of trap, or an animal that has been accidentally trapped, report this to the City. Enjoy Albuquerque’s coyotes at a distance. Most coyote attacks and bites occur when people try to feed wild coyotes or treat them like domestic animals. The following are some steps you can take to reduce human/coyote conflict. DO NOT FEED COYOTES! Although it is extremely rare, most incidents of coyotes biting or attacking humans result from feeding coyotes. This can include intentional or unintentional feeding. Albuquerque is a dry climate. Eliminate any water sources coyotes may use. Place bird feeders in areas inaccessible to coyotes. Coyotes will not only eat the seed, but they are also attracted to the birds and small mammals that come to the feeders. Do not put garbage in areas accessible to coyotes. Keep garbage in secure containers, and do not move trash to the curb until the morning of your scheduled pickup day. Feed pets indoors if possible. If feeding outdoors, pick up any leftovers. Store pet food in areas inaccessible to coyotes. Do not allow small pets to run free. Keep pets indoors at night. Walk your pets on a leash. Avoid brushy or overgrown areas where coyotes may be hidden. Spay or neuter your dogs. Keep your pet's vaccinations current. Clear brush piles or overgrown shrubs from property. Close off crawl spaces or any openings under buildings or structures. Fencing may help keep coyotes from visiting your yard. A fence should be more than six feet high, with the bottom extending at least six inches below the ground. Coyotes are excellent jumpers and diggers. Remember, no fence is necessarily coyote proof. 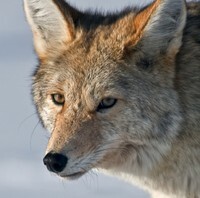 Teach children that coyotes are not domestic dogs and should be observed from a distance. Tell children to tell an adult if they see a coyote. If you see coyotes in your area, discourage them from visiting. Scare them away by shouting, making loud noises, or throwing rocks. See Coyote Hazing below. If a coyote approaches you do not run. Maintain eye contact and make yourself appear larger. Try to move to an area with more activity. Hazing simply means scaring a coyote away from you, your yard, or your neighborhood. Coyotes are members of the dog family, and just as we train our dogs to adopt good behavior, we can reinforce a coyote’s natural instinct to avoid people without harming them. Keeping coyotes wild and wary is the key to successful coexistence. Do not haze if you suspect a coyote is sick or injured. Report any coyotes that are suspected of being sick to 311. Do not haze if it is early spring – early summer, and you are in an area when coyotes may have a den. Give these animals room. They will actively try to protect the den and may try to haze you away from the area. Keep pets leashed and pick up small animals. Do not run from the area. Stand your ground. Make eye contact. Advance toward the coyote if there is hesitation on the part of the coyote. Use hazing tools such as noisemakers or surprises (garden hoses, water guns with vinegar water, pop-open umbrellas, motion activated lights or sprinklers) to frighten the animal. Haze until the coyote retreats. Allow room for the animal(s) to escape. Make sure the coyote is focused on you as the source of danger or discomfort. Do not haze from a building or car where the coyote cannot associate you as the source of fear. If you see more than one coyote, continue your hazing efforts; multiple animals will most likely respond to the same hazing techniques at the same time. Make it multisensory. Use tools that scare with sound, light, and motion. Variety is essential. Coyotes can learn to recognize and avoid individual people, so the more often a coyote has a negative experience with various hazing tools and different people, the faster it will change its behavior to avoid human contact. Hazing should be exaggerated, assertive, and consistent. Neighborhoods should always maintain some level of hazing using a variety of tools so that coyotes do not return to unacceptable behavior over time. Coyotes have routine habits. Make note on when and where you encounter them. Ask neighbors in those areas to help scare the coyotes, or avoid those areas. Aggressive coyotes are animals that may approach people while showing teeth, with back fur raised, and lunge or nip without contact. Aggressive coyotes may also bite or injure a pet that is on a leash. Coyotes that freeze and stare at people, or only move a short distance before stopping and looking, are likely not aggressive. Coyotes are curious animals that are comfortable in urban environments, and will sometimes follow people and/or pets on leash. These animals should be actively hazed. To report an aggressive coyote, call 311 immediately. If a coyote has bitten or injured a person this should be reported to 911.